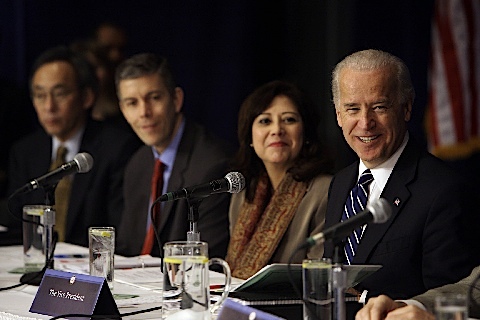 Vice President Joseph R. Biden Jr., right, was joined by Labor Secretary-Designate Hilda Solis, second right, Education Secretary Arne Duncan, and Energy Secretary Steven Chu, among others, at a meeting of the Obama administration’s Middle Class Task Force in Philadelphia last week. Task Force focuses on green jobs as a pathway to a strong middle class. Washington, DC – The White House Task Force on Middle Class Families, led by Vice President Joe Biden, is holding its inaugural meeting today in Philadelphia at the University of Pennsylvania. The Task Force has a simple mandate: to find, highlight and implement solutions to the economic challenges facing the American middle class. With President Obama announcing last week more than $20 billion for investment in a cleaner, greener economy – including $500 million for green job training – the Task Force’s first order of business is to evaluate what investing in green jobs will mean for middle class families. The Vice President is being joined by several cabinet members and members of the Task Force including: Secretary of Agriculture Thomas Vilsack; Department of Labor Secretary Hilda Solis; Secretary of Department of Housing and Urban Development Shaun Donovan; Secretary of Transportation Ray LaHood; Secretary of the Department of Energy Steven Chu; Secretary of Education Arne Duncan; and Director of White House Domestic Policy Council Melody Barnes. “Our commitment to renewable energy is creating green jobs and bolstering America’s middle class. Advancing broadband access to rural America will help save middle class jobs while greatly expanding job opportunities,” said Agriculture Secretary Tom Vilsack. “Green jobs aren’t just jobs of the future, they are jobs of today. By investing in our nation’s greatest asset – its people - we cannot only reduce dependency on foreign oil and emissions in the future, but also restore economic security for all today,” said Labor Secretary Hilda Solis. 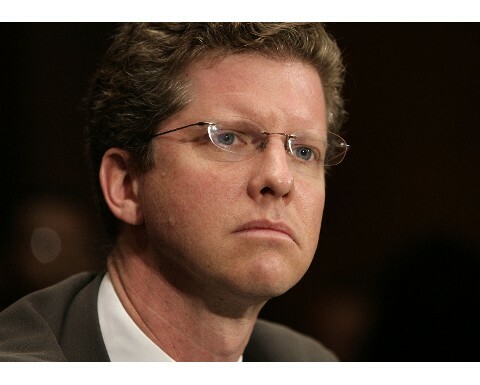 U.S. Department of Housing and Urban Development Secretary Shaun Donovan. "We will put middle class people back to work as we rebuild our roads, bridges and railroads," said Transportation Secretary Ray LaHood. "Economic recovery is about more than making sure that Wall Street rebounds or the big banks survive; a true recovery means an economy that works for middle class families. That's why the Obama-Biden plan to invest in renewable energy and make our homes and businesses more efficient is so critical. We can create millions of new jobs, save families money on their energy bills and end our dangerous dependence on foreign oil,” said Energy Secretary Steven Chu. “Vice President Biden’s focus on the middle class is directly aligned with our focus on improving education and college access. This is about the American Dream and it starts with education. The green jobs of tomorrow demand a quality education today,” said Education Secretary Arne Duncan. In addition, before the Task Force meeting, Pennsylvania Governor Edward G. Rendell and Philadelphia Mayor Michael Nutter joined the Vice President and several Task Force members for a tour of the University of Pennsylvania’s Operation Command Center where they examined the innovative ways the University is conserving energy and the green job opportunities these innovations have sparked. Members of the Pennsylvania Congressional delegation are also joining the Task Force meeting and discussion, including Senator Arlen Specter; Senator Bob Casey; Representative Chaka Fattah; and Representative Robert Brady. The Task Force will hear presentations from experts on the potential to create green jobs as a part of economic recovery and on how to connect people to training and opportunities in the green economy. The task force will then hold an interactive discussion with questions and answers on the information presented. Successful green job models in cities and states across America require government leadership to get the engine of green job growth started. The Task Force continued to operate with complete transparency. The entire meeting was open to the press and all materials distributed at the meeting, along with transcripts and video posts will be up on the Task Force’s public website. About the Middle Class Task Force: The Middle Class Task Force, chaired by Vice President Biden, is working with a wide array of federal agencies that have responsibility for key issues facing the middle class to expedite administrative reforms, propose Executive orders, and develop legislative and policy proposals that can be of special importance to working families. One of the things that makes this task force distinctive is it brings together - in one place - those agencies that have the most impact on the well-being of the middle class in our country.